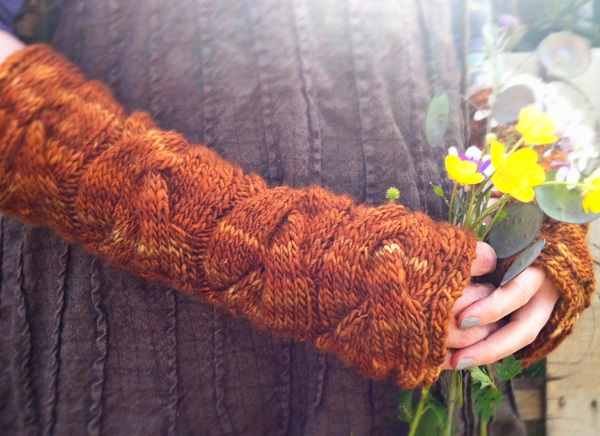 Layers of warm wool are a must up here in the quiet, cold, misty climes of the Pacific Northwest; these ultra-cozy armwarmers with deep, decadent, sidewinding cables are the perfect accessory for the weather. 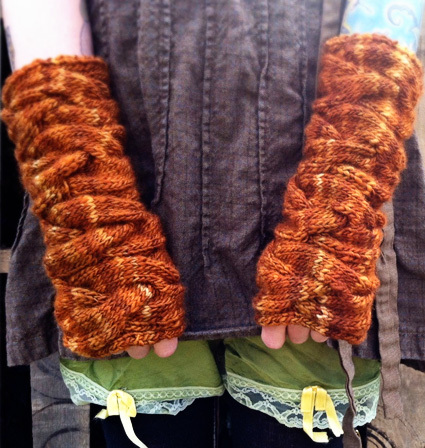 These armwarmers were inspired by the travels that landed us, independently and quite accidentally, in The City of Subdued Excitement, also knows as Bellingham, Washington. Kate found home here after a road trip from Ohio that was abruptly but fortuitously halted by the exhaustion of her gas money. Rachel hitchhiked from her home state of Mississippi out to California, but was pulled further and further north by the increasingly green and lush scenery. Both of us came out west with just the bare necessities, which somehow included a spinning wheel each. One short conversation -- in the bulk isle of the food coop -- later, Spincycle Yarns was born. Now, eight years later, our tendencies toward wanderlust are somewhat tempered by motherhood and urban homesteading responsibilities, but we can't forget the adventures we had getting here! Here's how we got this yarn: We kettle-dyed the BFL roving using acid dyes that we mixed to get a lovely burnt orange. We love solids, but only if they are semi solids, so we don't mind if the dye solution gets a little more or a little less concentrated on parts of the roving. Variegation is kind of what makes our yarn ours. This colorway, Gluttony, was spun worsted after splitting the roving several times, with the forward hand taking special care to smooth the yarn and show off the luster of BFL. We highly recommend handspun yarn for this project. The subtle variations in color and texture will add ever so much depth to this already decadent project! C12B: Slip next 6 sts to cn and hold in back of work; k6, then k6 from cn. C12F: Slip next 6 sts to cn and hold in front of work; k6, then k6 from cn. Rows 1, 3, 5 [RS]: K2, p2, [k18, p2] to last 2 sts, k2. Row 2 and all following even rows [WS]: P2, k2, [p18, k2] to last 2 sts, p2. Row 7 [RS]: K2, p2, [k6, C12F, p2] to last 2 sts, k2. Rows 9, 11, 13 [RS]: As Row 1. Row 16 [WS]: As Row 2. Row 7 [RS]: K2, p2, [C12B, k6, p2] to last 2 sts, k2. Work 2 full repeats of Right Cable pattern, ending after Row 16. Work Rows 1 and 2 of next repeat of Right Cable Pattern as set. Next row [RS]: Work 64 sts in pattern as set; BO next 6 sts; work to end of row in pattern as set. Following row [WS]: Work 16 sts in pattern as set; using backward loop cast-on, CO 6 sts; work to end of row in pattern as set. 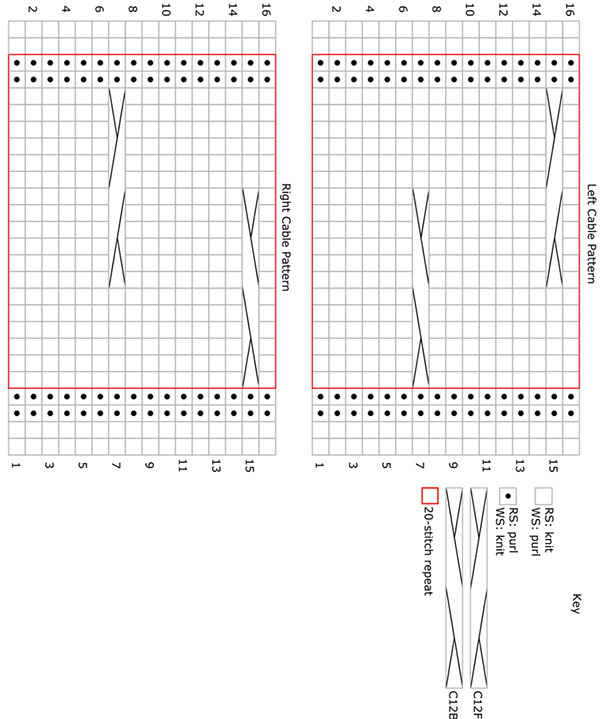 Complete the repeat of Right Cable pattern, ending after Row 16. Work 10 rows of Left Cable Pattern. Complete the repeat of Left Cable pattern, and work 2 more full repeats, ending after Row 16. Fold each finished piece so that the cast-on and bound-off edges are touching. Seam horizontal edges, paying careful attention to tension so that the seam is invisible. Kate and Rachel are the hardest working spinsters in town. 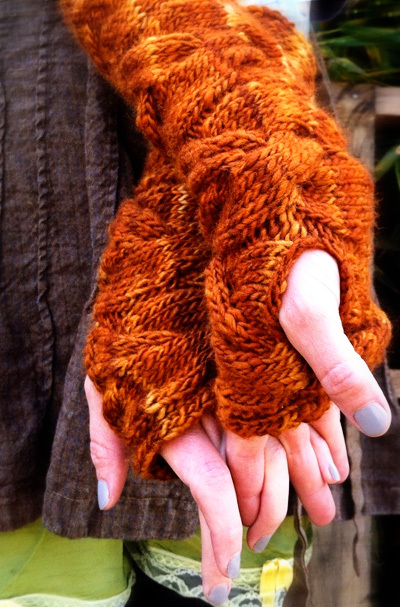 Their specialty is designing comfy and practical knitwear inspired by the textures and colors of handspun yarn. 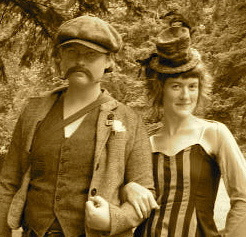 They reside in Bellingham, Washington, with their respective husbands, children and chickens. Kate and Rachel's yarns have been featured in Spin Off, Knit.Wear, Vogue Knitting and The Wheel; their designs have been published in Intertwined and are available on Ravelry. Spincycle Yarns are available online.